Security and speed are two crucial aspects when it comes to choosing a VPN service, but not all providers manage to combine them effectively. While SpyOFF is not as popular as the big names in the VPN industry, it is gaining a lot of attention lately thanks to the fast performance of its service and its high quality software. SpyOFF is operated by Sareta S.r.l, a company based in San Marino. The service is particularly aimed at German-speaking users, although the website is also available in English. SpyOFF offers reliable service and its generous free trial allows users to test the service for up to 15 days. SpyOFF uses 256-bit SSL encryption to keep your data secure and when it comes to VPN protocols, you have the option to select between PPTP, L2TP and OpenVPN, which supports TCP and UDP. Although SpyOFF doesn’t provide detailed information about the encryption used, it is committed to keep your online traffic protected. If you need a strong level of protection for your online traffic, make sure that you choose the Ultra Secure option as it uses OpenVPN. For streaming and general browsing, you can opt for L2TP and PPTP, which offer faster speeds but less security than OpenVPN. DNS leak protection is available once you connect to the VPN. 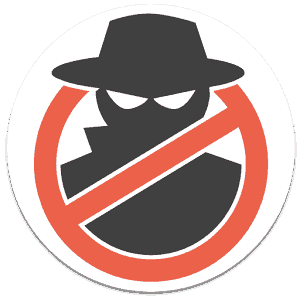 One of the most important aspects of a VPN is its approach to privacy. 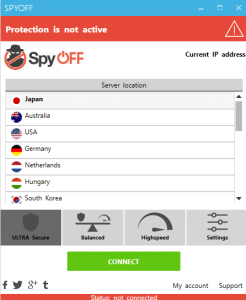 SpyOFF promises not to monitor or to keep logs of your online activities. Your browsing, conversations and everything else that you do on the internte will remain private. In order to register for the service, you are only asked to provide your email address and to set up a password. That being said, some connection details are kept, as well as payment information and at the moment, Bitcoin and other anonymous payment methods are not accepted. SpyOFF works with a wide range of operating systems including Android, iOS, macOS, Windows and Linux. There are dedicated apps for iOS, Android, macOS and Windows and the service can be set up on Linux manually with the help of the guides available. In addition, it is possible to purchase DD-WRT routers that can be used to run the VPN service across multiple devices including gaming consoles. When it comes to the dedicated software, SpyOFF has created a simple and clear interface that features great design. The settings can be adjusted manually, if you prefer it, which will allow you to get greater control over the security of your connection. You can select the protocol that better suits your needs and it is possible to enable the kill switch feature to prevent your IP address from being exposed. 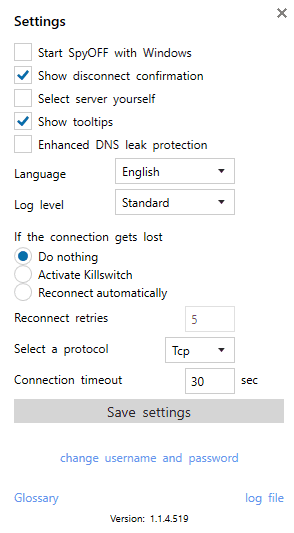 If the VPN disconnects, the kill switch will shut down internet applications automatically. You can connect to over 300 servers in 21 countries including Canada, Brazil, Australia, Switzerland, Spain, Japan, Hungary, Netherlands, United States and United Kingdom. There are over 14,000 IP addresses available so you can easily conceal your real IP address and bypass restrictions without hassle. You just need to select the country you wish to connect to and you will get a list of the servers available there. The servers can also be filtered according to their level of security or speed. In general, users in Europe will enjoy fantastic speeds and while the speeds in other locations may be slower, you can get good results for browsing or streaming. Currently, there are three plans available. The Starter plan is a monthly plan that offers full bandwidth, access to all the servers in the SpyOFF network and high protection for your online traffic. It costs €9.99, which at the time of writing is about $11 USD. The Premium plan offers the same benefits of the Starter plan, but it is billed annually and it allows you to save money in the long run. It costs €83.88 (€92.86), which means that the monthly cost is reduced to €6.99 or $7.74 USD approximately. The most advanced solution is the Premium Plus plan, which costs €10.99 per month (around $12.17) when you pay for one year in advance. This plan comes without bandwidth restrictions, as well as anonymous premium support, Usenet with up to 1GB capacity and access to tips that will help you to get the most out of your VPN. Compared to other providers, SpyOFF is an expensive solution, but it can be the most convenient option for customers in Germany and Austria due to the great speeds in Europe and the German support available. Plus, the 15-day free trial allows you to access all the servers and features supported and gives you enough time to find out if SpyOFF is right for you. SpyOFF’s website offers a Knowledge base, as well as tutorials and information about payments and account details. We would like to see a more extensive FAQ, but the Support section covers key aspects of the service and there are useful guides available. They also have presence on social media platforms like Twitter and Facebook. If you need to reach out to the team, you can do so via email-based ticket system. Although there is no live chat at the moment, they respond to the tickets in an efficient and professional manner. Reliability and efficient speeds are the main highlights of SpyOFF. The apps are easy to use and the service is ideal for German speaking customers. Although the price is higher than what you pay for other VPN solutions, the free trial is quite generous. SpyOFF has good features and its fast performance make it an option that is worth of consideration.